Pacific Park On the Santa Monica Pier discounts - Hotels Etc. 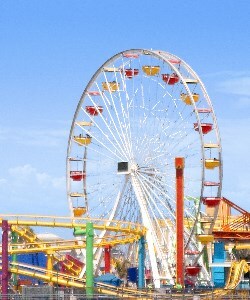 Located on the world famous Santa Monica Pier, Pacific Park® is the family place to play! It's the West Coast's only amusement park located on a pier. Millions of visitors each year enjoy all the rides, games and fun you'd expect from one of Southern California's Leading attractions. Pacific Park® has it all... a dozen rides, midway games, ocean front specialty food outlets and seaside shopping.